What is the treatment for cauliflower ear? What is the prognosis for cauliflower ear? How can cauliflower ear be prevented? Cauliflower ear is an acquired deformity of the outer ear. It is usually due to blunt trauma to the ear. When the cartilage of the ear is injured by trauma or inflammation, the blood supply from the skin is disrupted, often forming a large pocket of blood, called a hematoma. As the injury to the ear heals it can shrivel up and fold in on itself and appear pale, giving it a cauliflower-like appearance, hence the term cauliflower ear. Wrestlers, boxers, and martial artists in particular are susceptible to this type of injury, therefore, cauliflower ear is also sometimes called boxer's ear or wrestler's ear. In 2014, UFC fighter Leslie Smith's cauliflower ear exploded after a direct hit from opponent Jessica Eye, causing the fight to stop. The fighter had an existing cauliflower ear that was intermittently being drained of fluid before the fight, but the ear was further damaged by the intense blow, causing it to bleed profusely. The ear is vulnerable to blunt trauma. 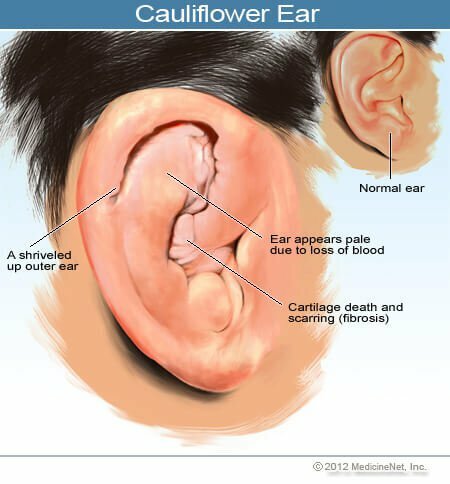 When the ear is struck and a blood clot develops under the skin, or the skin is sheared from the cartilage, the connection of the skin to the cartilage is disrupted, causing cauliflower ear. 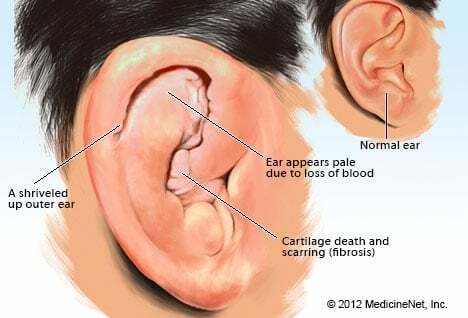 The cartilage of the ear has no other blood supply except that supplied by the overlying skin. When the skin is pulled from the cartilage, and/or separated from the cartilage by blood (as with accumulated blood from injury or inflammation, or infection), the cartilage is deprived of important nutrients. Ultimately, the cartilage dies and the risk of infection is increased. Untreated, the ear cartilage contracts on itself forming a shriveled up outer ear, known as the cauliflower ear deformity. Once cartilage death and scarring (fibrosis) occurs, the resulting deformity is generally permanent. The ear may also appear pale, due to loss of blood supply. In some cases, cosmetic procedures may improve the appearance of the ear. Cartilage damage may also result from piercing the upper ear in the cartilage. Piercing can lead to a type of ear cartilage infection called auricular perichondritis, which can result in cauliflower ear. An even more rare cause of cauliflower ear is from the inflammation of cartilage in relapsing polychondritis. The anatomy of the ear can be a little confusing, especially since the ear is responsible not only for hearing, but also for balance. There are three components to the ear: the outer ear, the middle ear and the inner ear. All three are involved in hearing but only the inner ear is responsible for balance. Because cauliflower ear is usually due to trauma, the symptoms depend on the severity of the trauma to the ear. If the damage from the trauma is severe and medical attention should be sought immediately. Once scarring and deformity of the cartilage occurs, there may be no symptoms. The goals of treatment are to prevent permanent damage to the cartilage by draining blood from the hematoma, treating any infection, and reducing inflammation in order to re-establish the connection of the skin to the underlying cartilage. Antibiotics are prescribed to prevent infection. Patients may be referred to an ear, nose, and throat doctor (otolaryngologist) or plastic surgeon to treat this deformity and assure proper healing. Cauliflower ear repair consists of draining accumulated blood (the hematoma) through an incision in the ear and applying a compressive dressing to sandwich the two sides of the skin against the cartilage. When treated aggressively and promptly, cauliflower ear deformity is unlikely. Any delay in diagnosis leads to more difficulty in managing the problem, increased chances for insufficient blood supply to the ear cartilage, and escalated risk of deformity. Protective headgear and helmets worn during sporting activities can help prevent this condition. Helmets can also protect from serious head injury. See a doctor (preferably an otolaryngologist or plastic surgeon) for definitive care as soon as possible after the injury. What was the cause or type of injury that resulted in a cauliflower ear in you or someone you know? How did you injure your ear? Were there other injuries involved? Please describe your symptoms. What forms of treatment did you receive for your cauliflower ear? Cluster headaches are a type of headache that recurs over a period. Episodes can last one to three times a day during this time, which may last from 2 weeks to 3 months. The three main types of treatments for cluster headaches are, 1) Abortive medications that work to stop the process in the brain that causes migraines and stops the symptoms too. 2) Preventive prescription medications, or 3) surgery which involves blocking the trigeminal nerve. Is it possible to prevent ear infections? Take the Ear Infection (Otitis Media) Quiz to learn the risks, causes, symptoms and treatments for the common ear infection. A spinal tap or an epidural block can cause a spinal headache. In these procedures, a needle is placed within the fluid-filled space surrounding the spinal cord. This creates a passage for the spinal fluid to leak out, changing the fluid pressure around the brain and spinal cord. A spinal headache may occur up to five days after the procedure is performed. Such a headache may be prevented with bed rest after a procedure. Team spirit isn't the only thing that grows in locker rooms. From yellow toenails and itchy rashes to body odor and smelly gear, learn symptoms, fixes, and ways to stay healthy in the locker room and at the gym. Tinnitus is described as a throbbing, ringing, clicking, or buzzing in one or both ears. Tinnitus is caused by trauma to the ear, over exposure to loud noises, medication, and diseases or infections of the ear such as multiple sclerosis, TMJ, autistic neruoma, Meniere's disease, hearing loss, and aging. Treatments include medication, tinnitus masking, retraining therapy, and relief therapy.